Springtime in the Chesapeake Bay region of the eastern United States. 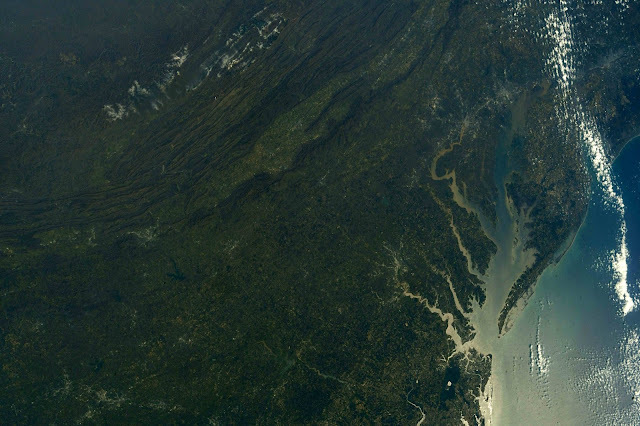 The Chesapeake Bay is an estuary in the District of Columbia and the U.S. states of Maryland, Delaware, and Virginia, lying inland from the Atlantic Ocean and surrounded to the west by the North American mainland and to the east by the Delmarva Peninsula. With its northern portion in Maryland and the southern part in Virginia, the Chesapeake Bay is a very important feature for the ecology and economy of those two states, as well as others. More than 150 major rivers and streams flow into the bay's 64,299-square-mile (166,534 km2) drainage basin, which covers parts of six states (New York, Pennsylvania, Delaware, Maryland, Virginia and West Virginia) and all of Washington, D.C. The word Chesepiooc is an Algonquian word referring to a village "at a big river". It is the seventh oldest surviving English place-name in the U.S., first applied as "Chesepiook" by explorers heading north from the Roanoke Colony into a Chesapeake tributary in 1585 or 1586.